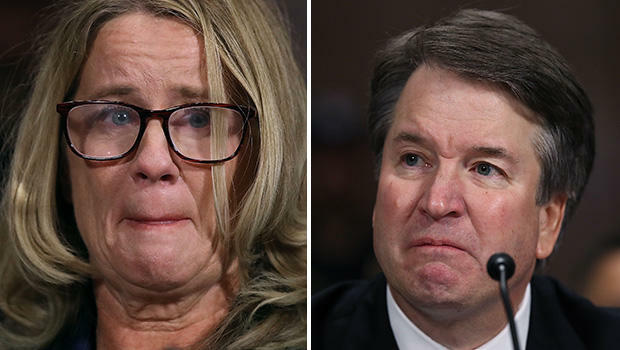 Dr. Christine Blasey Ford gave emotionally wrenching testimony before the Senate Judiciary Committee on Thursday, describing in detail how an inebriated Brett Kavanaugh and another teen, Mark Judge, allegedly locked her in a room at a house party in high school. She claimed Kavanaugh groped her and put his hand over her mouth to muffle her screams -- allegations Kavanaugh vehemently denied. After the hearing, Judge issued a statement via his attorney, once again denying any recollection of the incident described by Ford. In a letter addressed to Committee Chairman Chuck Grassley and ranking Democrat Sen. Diane Feinstein after the hearing on Thursday, Judge says he does "not recall the events described by Dr. Ford in her testimony before the US Senate Judiciary Committee today. I never saw Brett act in the manner Dr. Ford describes." He added: "As a recovering alcoholic and a cancer survivor, I have struggled with depression and anxiety. As a result, I avoid public speaking." Judge wrote that while he and Kavanaugh were friends in high school, they have not "spoken directly in several years." In her testimony, Ford recalled the "uproarious laughter" of Kavanaugh and Judge during the alleged attack. She later told lawmakers she might be able to pinpoint when the alleged attack happened if someone could tell her when Judge worked at a local supermarket. Ford testified that she ran into Judge at the Potomac Village Safeway supermarket in Maryland six to eight weeks after the alleged attack. She said Judge, who she has identified as being in the bedroom during the alleged altercation, was arranging shopping carts and seemed "nervous" and didn't want to speak with her. Judge wrote in his book "Wasted: Tales of a GenX Drunk" that he worked for a few weeks at the local market the summer before his senior year at Georgetown Prep, meaning the summer of 1982. Judge called the experience helping people to load groceries into their cars a "nightmare," saying he was often still hungover or drunk when he got to work in the morning. Judge said he worked at the store for "a few weeks" to pay for football camp. According to 1982 annotated calendars that Kavanaugh released to the committee, football camp began that summer on Sunday, Aug. 22. If Judge worked at the store for the weeks leading up to football camp, the gathering where Ford says the assault took place would have likely happened sometime in late June or early July.